This is the first game in the Hydlide series. For other games in the series see the Hydlide category. Hydlide was originally released in Japan in 1984 for several systems. It is a prototype role-playing game (it lacks text and dialogues). An upgraded port titled Hydlide Special was releasded in 1986 for the NES. The only gameplay difference is the new ability to cast some spells. This port alone was localized to the USA in 1987 as Hydlide, when more advanced games (e.g. The Legend of Zelda) were already well known, and ultimately failed to capture the same attention outside Japan. Next to the original title Hydlide is often the Japanese translitteration ハイドライド ("Haidoraido", i.e. "Hydlyde"), as a reading help for Japanese players. In the kingdom of Fairyland, three magic jewels were enshrined in the palace to maintain peace in the kingdom. One day, an evil man broke into the palace and stole one of the three magic jewels. Without the third jewel, the two remaining jewels lost their magic sparkle. The magic spell that sealed the power of Varalys, the most vicious demon in the kingdom, was broken. During the turmoil which followed, the last two jewels were stolen. Varalys cast a special magic on Princess Ann, turning her into three fairies, and hid them somewhere in the kingdom. He then let loose a horde of monsters across the land and became the ruler of the kingdom. 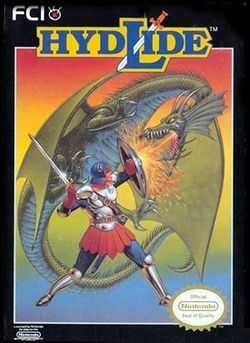 When Hydlide was released for the Famicom, it was actually given the name Hydlide Special to denote certain enhancements that this version contained over the original. Magic was only introduced to the series in Hydlide 2, but was retrofitted for use in the Famicom version of the original Hydlide. As a result, it plays only a minor role in the game. Hydlide is rather small, and can easily be beaten in only a couple of hours if one knows exactly where to go. In 1999, a special remake of Hydlide was released for Windows 95/98 that allowed players to choose between the look of the original PC-8001 version and a new high resolution Arranged mode. It has been translated into English by CinnamonPirate.com, and the patch for the translation can be downloaded here. This page was last edited on 12 July 2018, at 11:15.